Creative Bridesmaid Gifts from Captured Wishes! Chic and Creative Bridesmaid Gifts: Behold Your Captured Wish! If you're looking for an all-in-one, ready to gift bridesmaid appreciation gift idea, then Captured Wishes has your best interests in mind. You know what it's like. There are a million other things to take care of... then you realize the bridesmaids need a thank-you too! What to do? We've done it for you with this precious wish vessel that comes complete with a beautiful verse of gratitude and a color key. All you need add is your love and signature. A wedding day is incomplete without a bride's friends and family. Given the privilege of keeping you on the straight and narrow during this stressful, yet joyous occasion is sometimes a thankless task. You'll test their waterproof mascara with these delightful gifts, which will preserve their memory of your wedding day for years to come. Each Captured Wish vessel comes in beautiful custom packaging with a lovely verse card which puts the thoughts and emotions you have trouble expressing into words for you. 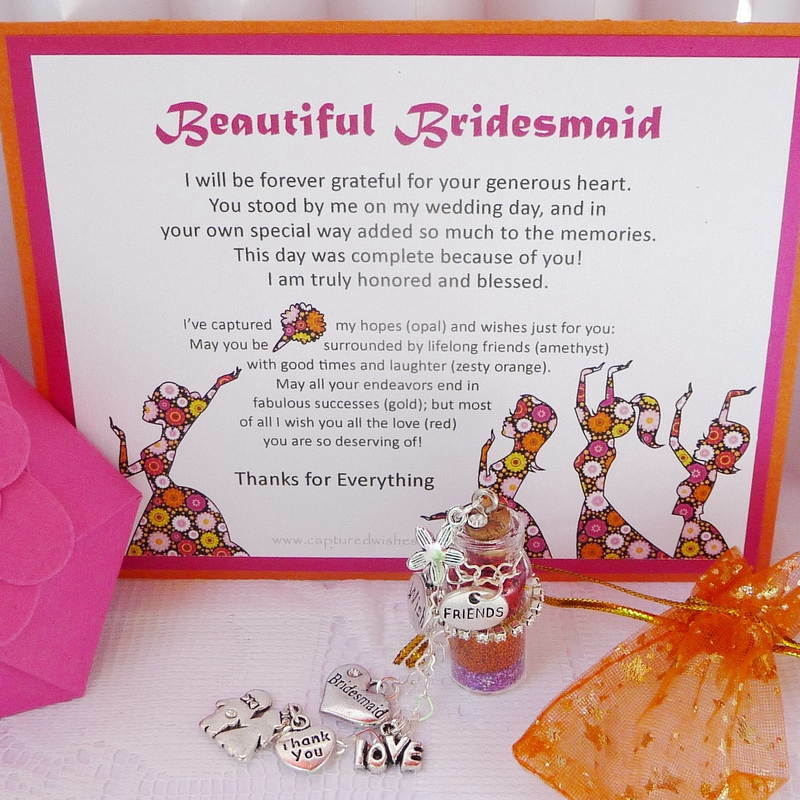 It can be really hard to find a gift that sums up not only your appreciation for the service your bridesmaids performed for you, but also exactly how you feel about them as friends and relatives. The bottle (40mm height including cork x 14mm wide) contains carefully layered Fairy Dust, explained right on the verse card.